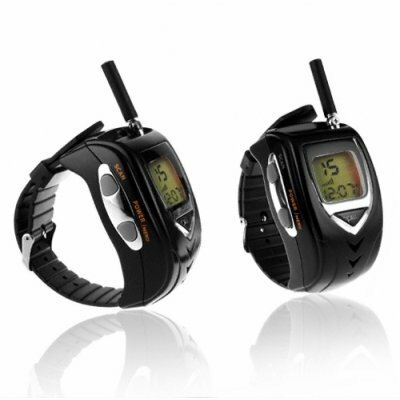 Successfully Added Walkie Talkie Watch Set - Edition - EU to your Shopping Cart. Walkie Talkie Watch Set - Edition - EU. Pair of stylish, matte black walkie talkies (also called 2-way radios) specially designed to fit on a wrist strap for a high-tech way of keeping in contact. Featuring multiple channel support, a backlit digital LCD screen, over 2 km operational range, and a rechargeable Li-ion battery, this is an extremely well-rounded and powerful communication device to own. on 2009-12-31 20:40:17 Bellissimi orologi!!! Good Wrist watches!!! Ottimo prodotto e perfettamente FUNZIONANTE!!! Ottima ricezione e trasmissione!!! Good product and good work!!! Montres reçues dans un emballage digne des plus grandes marques !!! Leur aspect et le contenu sont tout à fait conforme à la description et en plus commande passée le lundi 7/12/09 et reçue le jeudi 10/12/09 par UPS !!! pour ce qui est du fonctionnement je vous direz ça après noël (c'est un cadeau).Un grand bravo à Chinavasion !!! They look so cool and work's just as they should. Easy to use. Worked like a charm just out the box. No complaints here.